Why is Flight 175 still registered with the FAA ? Gene Corley, head of FEMA with photographer from Fox News takes credit for the picture of this piece of wreckage. It is the only piece found in that area, and as many folks know, the engine and landing wheel don't look like their from a 767. Seems pretty convenient that it just happens to be a piece with similar portholes setting in such a predominent place. View: Passenger windows on a piece of Flight 175's fuselage. Claim: On Sept. 11, FOX News broadcast a live phone interview with FOX employee Marc Birnbach. 911inplanesite.com states that "Bernback" saw the plane "crash into the South Tower." "It definitely did not look like a commercial plane," Birnbach said on air. "I didn't see any windows on the sides." Coupled with photographs and videos of Flight 175 that lack the resolution to show windows, Birnbach's statement has fueled one of the most widely referenced 9/11 conspiracy theories — specifically, that the South Tower was struck by a military cargo plane or a fuel tanker. FACT: Birnbach, who was a freelance videographer with FOX News at the time, tells PM that he was more than 2 miles southeast of the WTC, in Brooklyn, when he briefly saw a plane fly over. He says that, in fact, he did not see the plane strike the South Tower; he says he only heard the explosion. While heading a Federal Emergency Management Agency (FEMA) probe into the collapse of the towers, W. Gene Corley studied the airplane wreckage. A licensed structural engineer with Construction Technology Laboratories, a consulting firm based in Skokie, Ill., Corley and his team photographed aircraft debris on the roof of WTC 5, including a chunk of fuselage that clearly had passenger windows. "It's ... from the United Airlines plane that hit Tower 2," Corley states flatly. In reviewing crash footage taken by an ABC news crew, Corley was able to track the trajectory of the fragments he studied — including a section of the landing gear and part of an engine — as they tore through the South Tower, exited from the building's north side and fell from thesky. 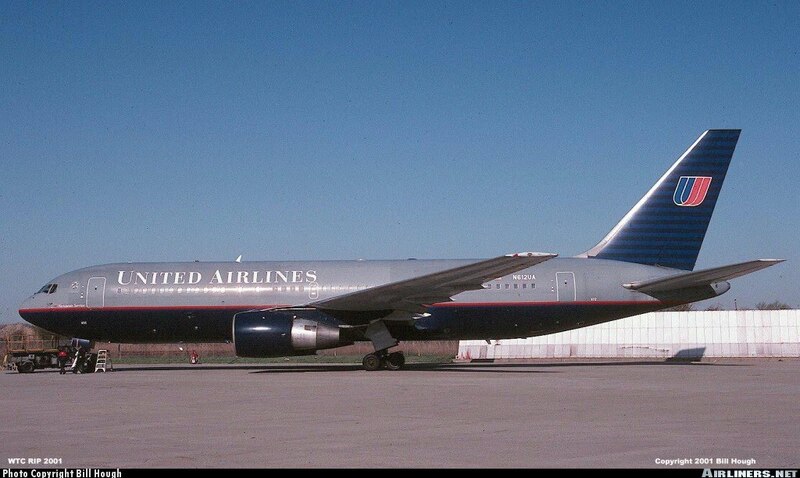 The United Airlines Flight 175 aircraft was a Boeing 767-222/ER, registration number N612UA. There have been claims, for many years, that the four 9/11 crash sites were not as they seemed. These range from the view that the observed damage at one or more sites wasn't caused by a plane at all, to the acceptance that an aircraft was involved - but not one of the hijacked flights. Critics of these ideas always wondered what happened to the original planes, but one particularly surprising answer has been presented: they're still flying. "The media and airlines tell us that N591UA and N612UA crashed on Sept 11, but FAA records say the planes are still valid and registered. And one UA employee let slip in his private website that he travelled on N591UA after sept 11, apparently not realising the significance of the plane’s ID"
The registration numbers were in fact cancelled eventually, but not until 2005: see the record for N591UA and number N612UA. It could be argued that this was a response to being "exposed", an attempt to cover up the truth... If it wasn't for the fact that other planes didn't similarly remain registered for years after being destroyed. The engine found in the street for flight 175 was the wrong one.